As part of our architecture practice, occasionally we try to participate in local, national or even international architectural design competitions. 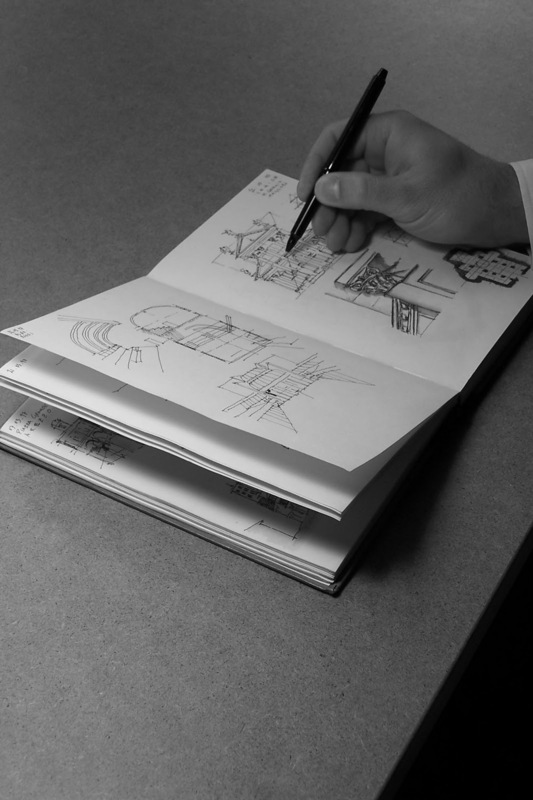 These are unique opportunities to not only submit design solutions to interesting architectural projects, but more importantly to consistently hone our creativity and design skills. Most competitions allow the opportunity to push the design envelop and to really dig deep for creative or unique design solutions which may not always be feasible in smaller projects. 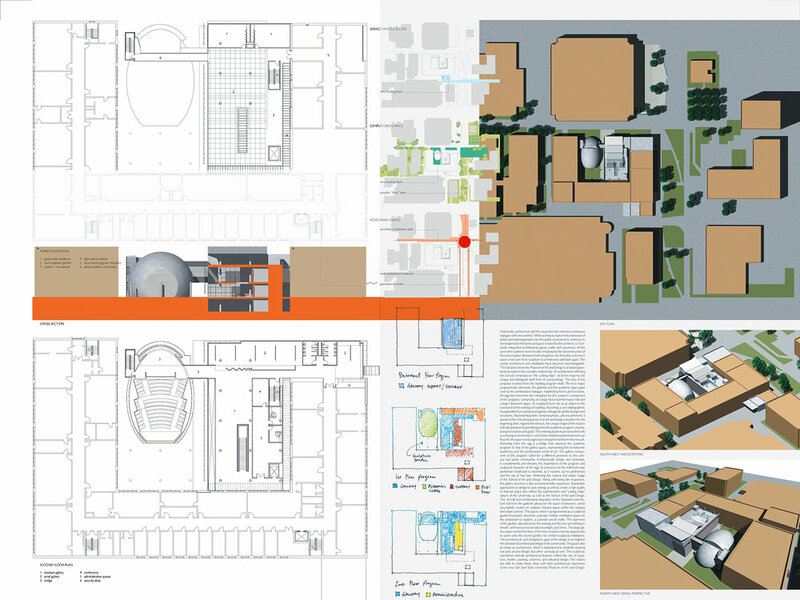 The design submission featured below is for The San Jose State University Museum of Art and Design, which involved creating a solution to fill in an existing courtyard to their existing U-shaped on campus building. Historically, architecture and the visual arts have shared a continuous dialogue with one another. While architects explore the extension of artists' personal expression into the public environment, artists are in turn inspired by the forms and space created by the architect. LeCorbusier integrated architectural spaces, walls, and sequences. At the same time painters more forcibly emphasized the deconstruction of the picture plane. Between both disciplines, the line blur as forms in space cross over from sculpture to architecture and back again. The words architecture and installation have become interchangeable. The San Jose State University Museum of Art and Design is an ideal opportunity to explore this complex relationship. An architecture reflecting the school's emphasis on "the cutting edge", its forms must too be unique and distinguish itself from its surroundings. The idea of this proposal evolved from the building program itself. The two major programmatic elements, the galleries and the academic space gave root to the architectural dialogue, establishing forms and functions. An egg form becomes the metaphor for the academic component of the program, comprising of a large lecture/performance hall and a large classroom space. Its sculptural form sits as an object in the courtyard of the existing art building, becoming a very distinguished, recognizable form juxtaposed against orthogonal, grid-like background structures. Representing birth, metamorphosis, and nourishment, it speaks of the role and purpose of an art and design education for the beginning artists. Against this tension, the unique shape of the lecture hall calls attention to an did distinguishes the academic program, emphasizing its functions and goals. The entering students are provided with a nurturing environment in which their intellectual development can flourish; the space encourages raw concept to transform into new art. 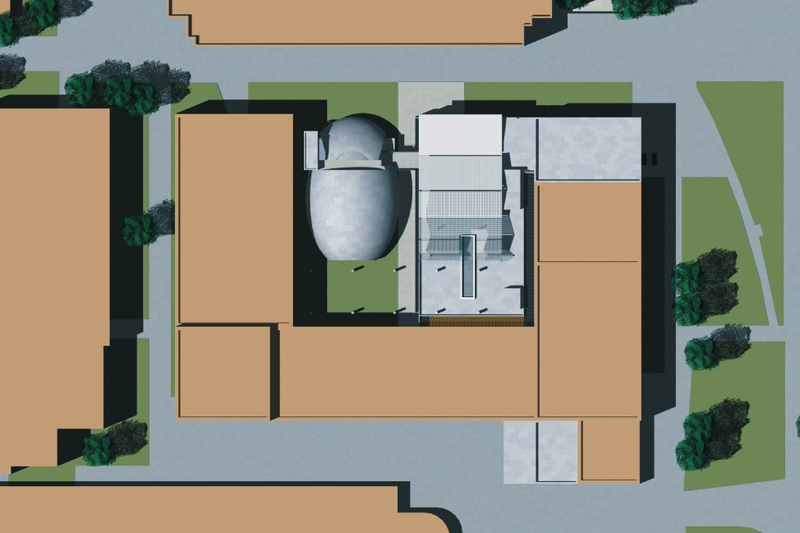 Extending from the egg is a bridge that connects the academic program to that of the gallery space, representing the tie between academics and the professional world of art. The gallery component of the program called for a different presence to the campus and public community. Architecturally simple and minimalist, it complements and elevates the importance of the program and sculptural character of the egg. Its presence on the trafficked main pedestrian boulevard is essential, as it reaches out to pedestrians and the city of San Jose. Reflecting the cultural and artist image of the School of Art an Design. Along with being site responsive, the gallery structure is also environmentally responsive. Sustainable approaches to design to save energy as well as create a high quality of internal spaces also reflect the sophistication and "cutting edge" nature of the University, as well as the School of Art and Design. The formal and architectural separation of the classroom and lecture hall from the galleries allows for the space in-between, which successfully creates an outdoor tranquil space within the campus and urban context. This space, which is programmed as a sculptural garden/courtyard, becomes a private, hidden meditative space for the pedestrian to explore, a private secret realm. The openness of the garden, also allows for the existing and the new art building to breath, and have access to natural sunlight, and views. The large gallery space on the first floor of the new museum has the opportunity to open onto this secret garden, for certain sculptural installation. The architectural and metaphoric goal of the design is to heighten the standard of architectural design in the community. The goal is also to create an architecture, which is inspirational to students studying not only art and design, but other curricula as well. The sculptural, sometimes delicate architectural features reflect the arts of sculpture, textiles, painting, ceramics, and industrial design. The visitors are able to relate these ideas with tier architectural experience at the new San Jose State University Museum of Art and Design. We have finally decided to begin an ONY blog devoted to architecture, interior design, and other design related topics. OUT OF THE BOX - Reimagining the kitchen space. Boston Globe Feature - "Architect’s transformation of Weymouth antique worth its wait in bold"